New London County Mutual Fire Insurance Company was formed in Norwich, Connecticut in 1840 by a group of local businessmen. Their primary purpose was to insure homes, farms and public buildings. At that time, much of the business written was in rural areas surrounding Norwich. By 1910, annual premiums were $180,000, the majority of which was farm business. In 1913, after having occupied leased quarters since the company was formed, NLC bought a new home office building at 59 Broadway, Norwich. By the company’s 100th anniversary in 1940, premiums had grown by less than $20,000 in 30 years to slightly under $200,000. However, considerable diversification had begun. Farm business had been reduced from nearly 70% of total premiums to only about 20%. NLC’s business was then being produced by over 75 independent agencies throughout Connecticut. The broader base of coverages and larger number of full-time agents formed an important base for the company’s future growth. Growth in premiums and staff again caused the Company to need larger accommodations. In 1958, under the direction of President Paul Franklin, NLC constructed a modern home office building at 90 Sachem Street. During the terms of Paul W. Franklin and D. Leslie Olsen, the Company became a major writer of homeowners insurance in Connecticut and began operating throughout Southern New England. In 1978, Robert T. Ramsdell became President and the Company had written premiums of about $6,000,000. 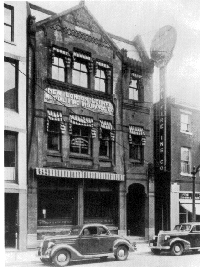 In 1983, growth again required expansion and a 9,000 square foot addition was constructed at the Sachem Street location. This brought the total size of the building to about 20,000 square feet. By 1990, the 150th anniversary of the Company, written premiums had surged to over $33,000,000. Diversification continued with homeowners making up only 48% of the Company’s written premiums with dwelling fire and commercial package policies making up about 37%. Personal automobile insurance, which the company began writing in 1985, now made up about 12% of the Company’s premiums. Due to continued Company growth, it was again necessary to move to larger quarters. After two years of study, NLC purchased seven acres of land on High Street in Norwich. This site had been vacant for many years, in part because of ledge that made its development very difficult. NLC’s President, Robert T. Ramsdell, liked the location because it gave evidence of local growth and demonstrated continued commitment to NLC’s Norwich heritage. In spite of the unusually high site development costs, NLC was able to proceed because of the assistance of the City of Norwich and the State of Connecticut Department of Economic Development’s Enterprise Zone Program. In October of 1990, NLC moved into a new three-story 48,000 square foot building with room for further expansion. Its location on the hillside overlooking Norwich harbor creates a major profile in the city’s skyline. The building was designed by Richard Sharpe Associates, P.C. of Norwich and built by general contractor Bartlett, Brainard & Eacott, Inc. of Bloomfield. This location continues today as the center of operations for the Company. In 2001, after 23 years as President, Robert T. Ramsdell retired. Under his leadership, the organization had grown from $6,000,000 to approximately $65,000,000 and had become a well-recognized carrier to its Independent Agents in all three of its states. Judy S. Jackson became the new President and CEO of NLC. During Ms. Jackson’s tenure NLC continued its growth and expansion with written premiums surging to over $100,000,000. Also during this time losses from natural disasters, and more specifically hurricanes, rocked the insurance industry and created significant changes in the way insurance companies assumed risk and provided for the security of their policyholders. This caused NLC to reduce the amount of business it wrote in its most loss prone classes of business and areas. The company’s written premiums shrunk to just over $65,000,000. While this was a traumatic time for the company and the industry as a whole, these changes ensured that NLC would remain a strong and viable entity protecting its remaining policyholders and securing its long-term future. In 2009, Ms. Jackson retired and passed the company on to Steve H. Chevalier. Mr. Chevalier became president and CEO on July 1, 2009. He joined NLC in 2000 and served as its Chief Financial Officer and Chief Operating Officer prior to taking the leadership position he continues to hold today. In 2010, NLC entered into an affiliation agreement with the Hingham Group which was headquartered in Hingham, Massachusetts. This affiliation brought together four property-casualty companies under a single management structure headed by Mr. Chevalier and the existing NLC management team. The Hingham Mutual Insurance Company was originally founded in 1826 adding to NLC’s long standing tradition of writing business in New England. The four companies, New London County Mutual, Thames Insurance, Hingham Mutual and Danbury Insurance gave the group representation in all six New England states and raised the written premium collectively to over $100,000,000.